Good Garage Scheme Car Servicing in Great Britain : Good Garage Scheme member runs highly successful ladies car maintenance evenings in their workshop. Good Garage Scheme member runs highly successful ladies car maintenance evenings in their workshop. Field’s Car Centre, based in Woking, Surrey has introduced a new and successful way of attracting more customers to their business. They have recently conducted the first of two ladies evenings with the second due to take place next month. Since joining the Good Garage Scheme over four years ago, they have achieved a highly commendable 97.41% rating from well over 500 customer feedback replies received on the Good Garage Scheme website. The evening covers motoring procedures such as MOTs and informal car maintenance including fluid checks under the bonnet plus tyre changing. 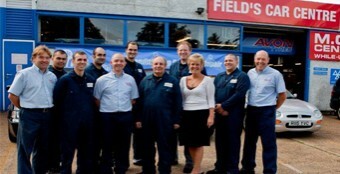 Field’s Car Centre, established in 1981 by brothers Richard and Michael Field, are also part of the “Buy With Confidence” scheme, introduced by Surrey County Council, in conjunction with Trading Standards. To register your interest in attending the workshop, please contact Lynne at Field’s Car Centre on 01483 766634.